Quick Note from Us! We're still travelling around beautiful New Zealand! Be sure to follow us on Instagram and Facebook to see what we're up to! Whilst we're away, we wanted to make sure you didn't miss out on any delicious recipes, so we made sure to prepare some extras before we left! I'm one of those people who simply cannot understand those who skip breakfast. You see, regardless of whether I ate late at night or earlier in the evening, I always wake up hungry for breakfast. Jesse could wait for hours for food after he wakes up - but me? I need food and I need it now. 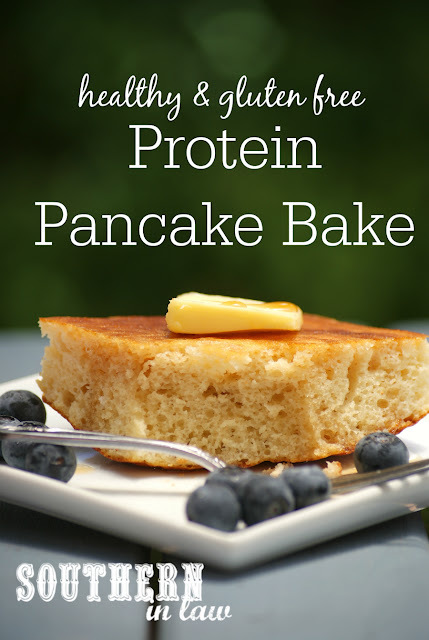 It's this need for breakfast that fuels my love of quick and easy breakfast options! I don't have the energy or patience to cook up a breakfast feast each morning, however, I still want to eat something delicious! Make ahead breakfasts like my beloved breakfast bakes and overnight oats mean that all I have to do in the morning is add the toppings! 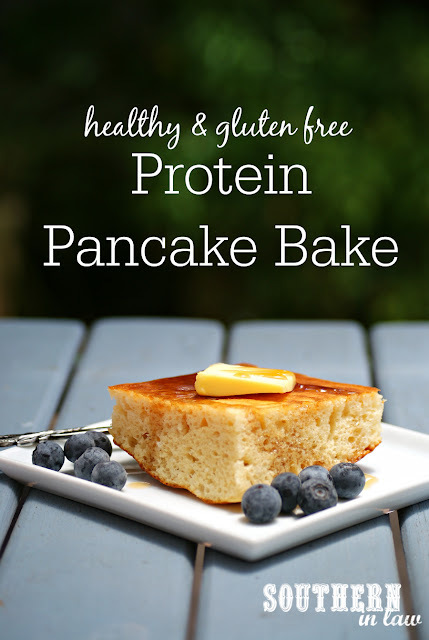 This Protein Pancake Bake is a current favourite as it's the perfect base for toppings - and so easy to make! All you have to do is make up a batch and store them in the fridge or freezer for a quick breakfast option. Eat them warm with butter and syrup, top them with peanut butter or greek yogurt or load them up with fresh fruit - the possibilities are endless! Mix your milk and vinegar and leave to sit whilst you get out all of your other ingredients. Mix your melted butter (or oil), egg, maple syrup and vanilla into your milk mix until combined. 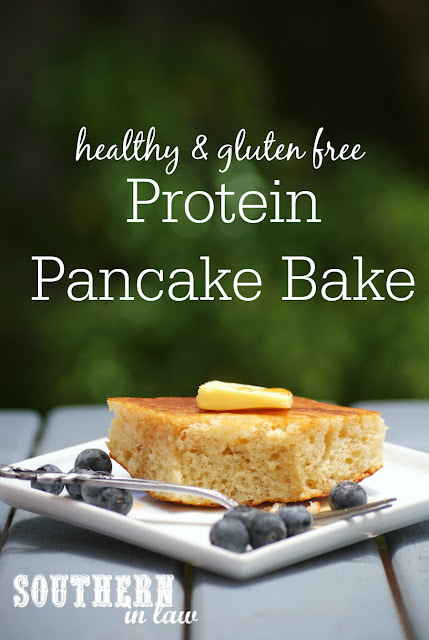 Stir in your protein powder, flour and baking powder, mixing until just combined. Pour your pancake batter into your baking tin. Bake for 20-30 minutes, or until cooked through. Your baking time will vary depending on the thickness of your pancake mix. Be sure to keep an eye on it and take it out as soon as a skewer inserted into the middle removes clean. Allow to cool slightly before slicing and serving - or keep the cooled slices in the fridge or freezer in an airtight ziplock bag. The bakes will keep for 2-3 days in the fridge or indefinitely in the freezer. *Use more/less depending on how sweet you like things - we use 1 tbsp and then add our sweet toppings on top instead! You can also use liquid stevia to taste or none at all if you have a sweetened protein powder. But tell me! Are you someone who wakes up hungry or could you easily wait to eat like Jesse? What's your current favourite breakky? !